In case you have the option of visiting only one island in Greece, we would suggest Santorini. You’ll be able to enjoy one of the most beautiful sunsets in the world, astonishing views of an active volcano (don’t worry, the last eruption was over 3,600 years ago, and it’s not likely to happen again anytime soon), which is possibly the only volcano whose crater is in the sea. You will also have access to amazing beaches. Keep in mind that the beaches might not appeal to everyone, since they’re mostly covered in red and black volcanic sand. Santorini will charm you with its snow-white houses with blue windows, and romantic views of the sea. No wonder its considered one of the best places for a romantic gateway. Moreover its a popular wedding destination. Choosing a place to stay in Santorini shouldn’t be too difficult. 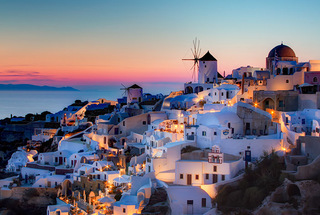 Lovers usually opt for Oia, a small village with unforgettable, romantic sunsets. Many consider staying in the capital of the island, Fira. It essentially offers everything Oia has, but it’s much more crowded, which is why many couples prefer staying in Oia. No matter where you choose to stay, make sure to visit the nearby villages and try the local cuisine, which is considered one of the best in Greece. If you get the chance, try the Santorini’s famous chloro cheese (hloro tiri) – a fresh handmade goat cheese that is unique to the island.